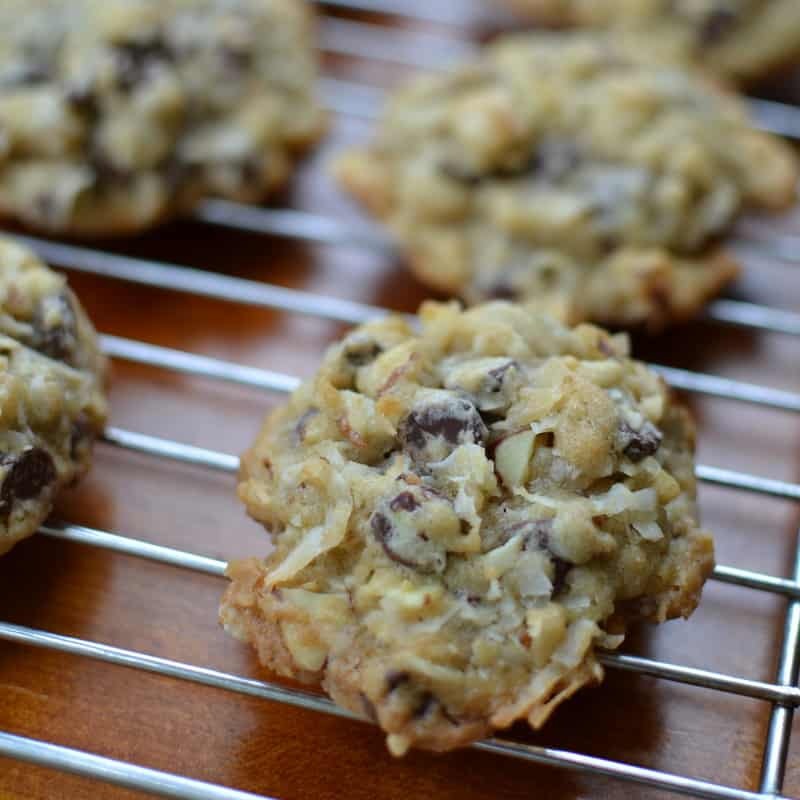 These Small Batch Almond Joy Cookies are the perfect blend of coconut, semi sweet chocolate and sliced almonds. They can be baked and frozen ahead of time. This is the time of year for all things cookie! One of my favorite candy bars is Almond Joy. To me they are amazing. What is your favorite candy bar? Are you a snickers fan? Maybe you prefer a Twix or a 3 Musketeers. 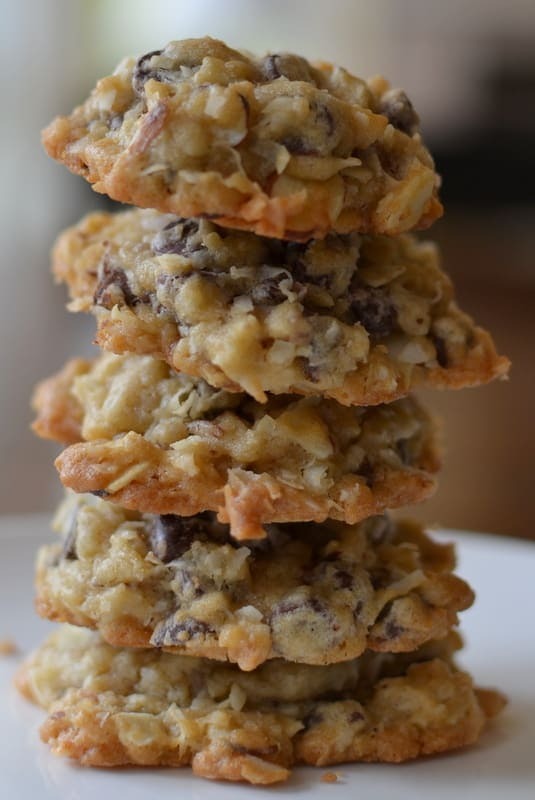 These Small Batch Almond Joy Cookies are the perfect blend of coconut, semi sweet chocolate and sliced almonds. They are simply amazing and I had better freeze them before I eat way too many of these delectable beauties. 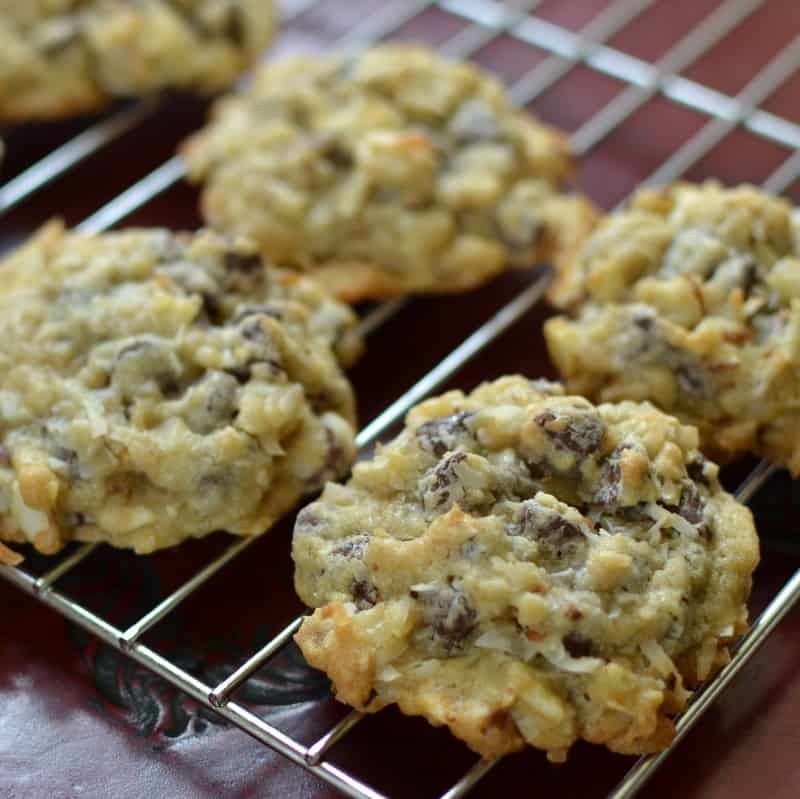 Small Batch Almond Joy Cookies can be baked and frozen ahead of time. I pack all my cookies in doubled Ziploc freezer bags and place them in sturdy glad-ware containers. When defrosting take them out of the containers frozen and place on serving trays or platters uncovered. Never allow them to defrost in the plastic and the containers. The condensation that builds in there will ruin the cookies! My darling daughter just loves these cookies and has declared that they are her new favorites. Do you have your holiday baking list together. These are perfect and they are a small batch recipe making it even better for your Christmas baking because if your family is anything like ours you will have fifteen cookies on your list. 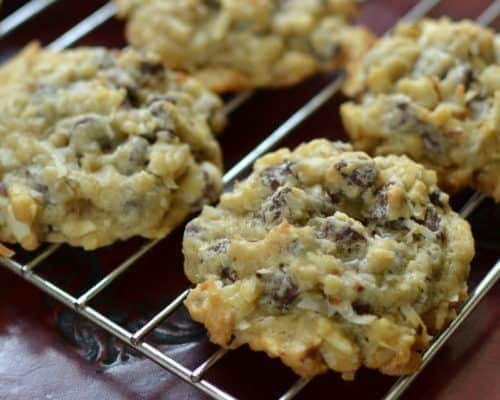 These Small Batch Almond Joy Cookies are just amazing!! Find lots of incredibly fun cookie quotes at BrainyQuote! In a bowl whisk together flour, baking soda and salt. Using mixer cream butter and sugars until light and fluffy. Add vanilla and egg and mix just until incorporated. Slowly blend the dry mixture into the creamed mixture. Stir in chocolate chips, coconut flakes and sliced almonds. Bake on parchment covered baking sheets and remove to cookie cooling racks after ten minutes. Other delicious cookies you will love! In small bowl whisk to combine flour, baking soda and salt. Set aside. Using mixer cream butter and sugars. Add vanilla and egg and mix just until incorporated. Slowly blend the dry mixture into the creamed mixture. Stir in chocolate chips, coconut flakes and sliced almonds. 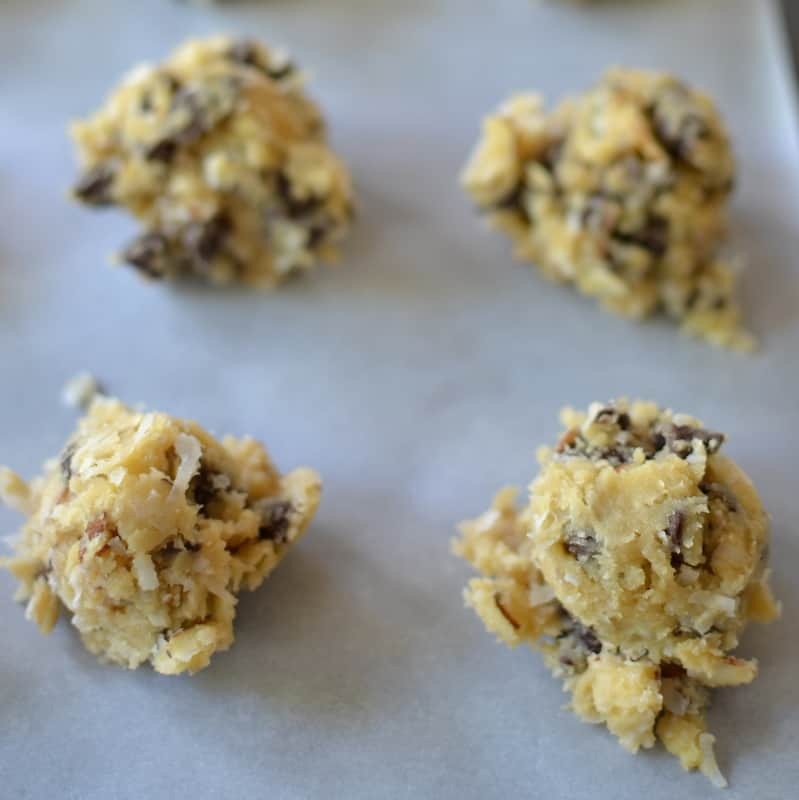 Using 1 1/2 tablespoon cookie scoop drop by rounded spoonfuls onto parchment covered cookie sheets. Bake for 9-12 minutes. Allow to cool for ten minutes before moving to cookie cooling racks. I had a reader report that you need to keep an eye on these cookies starting at 9 minutes. That they really start to brown up fast. I have not had a chance to remake these cookies since I purchased a new oven. I made these a few days ago. They are amazing! !—and still taste as fresh as day one! Thanks so much for sharing this recipe. It’s definitely a keeper!! Thank you so much! I appreciate your kind words. Can this cookie dough be frozen and then baked? Yes it can. You might need to add a couple of minutes to the baking time to bake from the frozen state. Made these today and couldn’t be happier! I do have to say – at least for my oven/experience – I really had to watch them. The first batch was starting to burn on the bottom after 10 minutes and the 2nd batch completely burned after 13 minutes (I had to answer the door so they got neglected). Super tasty. I would choose these over a candy bar. Thanks so much! So glad that you liked them. Thanks for the heads up! I have not made these since I got a new oven. I will make a note on the recipe and perhaps reduce the time zone by a minute. Absolutely loved this recipe! Cookies are delicious! 12 minute baking time was perfect! Wouldn’t change a thing. This is definitely a keeper for me. Thanks so much for sharing! Thanks so much. So glad that you liked them. They are one of our favorites! Hey Beth, Good Day !! Can I substitute almond flour or coconut flour for the AP flour in this recipe? And can I substitute Splenda brown sugar and sugar in this recipe?? Good morning! I am not sure. I have not tried. Please let us know if you do and what the results were. I substituted Splenda and they came out fine . I do find them to be bit dry, which maybe due to the substitution. Gotcha. That could be because I have never found them dry. Thank you! I use regular size chocolate chips. How much sugar should I add if i use unsweetened coconut flakes? I would think just one teaspoon. Coconut is naturally pretty sweet. Has anybody tried making this with earth balance butter (no dairy ) and rice flour ? Just made these because I’m still in the NEW OVEN mode (switched from electric to gas range) and it’s so fun to make new things. These cookies are super delish!! Thanks for the recipe–also almond joys are amazing candy bars so…come on HOW can you lose. Thanks so much! I agree with you! How can you lose! Such a delicious cookie! I will be giving these a try! Is the butter salted or unsalted? Beth, freezing would probably not stop me. 😂 I wouldn’t mind eating them frozen! They look delicious and tomorrow I am making a batch. Thanks for sharing the recipe. LOL! It never stopped me either! The pleasure is all mine! Thank you! Happy baking! I think I am addicted to exclamation points!!!! Can you double the recipe? Yes you most certainly can! I just made this cookie and I am so happy with the results. For all you other novice cookie makers 1/8 cup is 2 tablespoons. Knowing my oven bakes hot I baked them at 350 for 10 minutes and they turned out great! Thanks for a new cookie recipe that I will keep. Awesome! I am so glad that you liked them! They are delicious little nuggets! I baked mine the same way. Just saw this recipe and can’t wait to try tomorrow ! I made these wonderful cookies with gluten free flour for my wife, they turned out great. This is such a great receipt I tried substituting the chocolate chips and almonds for butterscotch chips and pecans. Wow! These are amazing too! Thanks so much! How cool! Thanks for the heads up! I will have to try the butterscotch and pecans! How yummy! My husband said it’s the best cookie I’ve made. I like to bake, so that’s a huge compliment. Turned my oven down to 350 and baked 12 minutes. The pleasure is all mine! So glad that he liked them and I will take it as a big complement! I needed a little boost this morning! Made these cookies last weekend and they were a HUGE hit at school! My administrator asked for a personal batch TWO DAYS IN A ROW! I’m currently working on a double batch to box and give as Christmas gifts to the administrative assistants and custodial staff! Thanks for sharing the recipe! My pleasure Erin! So glad that everyone liked them! You must be quite the baker filling all those requests!! Can you use milk chocolate chips instead? I don’t understand in the above ingredients it states 1 and 1/8 cup of flour….never heard of 1/8 cup? Is this a typo? It is two tablespoons. I really did not want to put one cup flour plus two tablespoons. One of my favorite cookies (which is pretty much a short list of 2). I will be making these next week. I must comment on the 1/8 cup of flour as a former student of culinary school, using 1/8 cup is a no no! I have used many recipes that call for a cup of this or that, plus 2 tablespoons or teaspoons. Never had I seen 1/8 cup used. They are delicious little cookies. Thanks for the heads up but they even sell the 1/8 cup now. I am making these this morning using toasted coconut. I have lots of this coconut that I got in my co-op recently. It will be interesting to see if this works!! Looking forward to making these. My husband is a huge coconut fan. Thanks for sharing! Followed directions exactly. Cookies taste pretty much like a typical chocolate chip cookie. Disappointed I didn’t get that Almond Joy flavor. I think they are delicious and I love their flavor. I have to agree. They taste good but I wouldn’t call them Almond Joy cookies just because they have coconut, chocolate, and almonds. I bake this recipe and was awesome. I make another batch with white chocolate chips and turns out good. Thank you so much for sharing this. My friends love it too. What a sweet comment. Thanks so much! I am so glad that you liked them. Could you use almond flour instead of reg flour ? I am not sure! I have not tried. Please let us know if you do and how they turn out! Wondering if anyone has frozen them after baking. I am thinking of making them and freezing some. I have never frozen cookies with coconut in them. Several people commented that they have done so. These are the best cookies I’ve made so far ! I’ve turned to mixing cookies and cakes instead of alcoholic beverages! My self rehabilitation 👌thanks for sharing!! My pleasure Dennis! What a great plan! Sounds wonderful but who eats one cookie. LOL! So true! You should make them! They are delicious! How can you get 24 to 26 cookies? I used 1 Tablespoon and only got 12 cookies. Hum…thanks for the heads up. Maybe my notes on this recipe are incorrect. Did you omit anything? Some easy diabet Cookie recipes would be nice. Thanks for sharing! It is so nice to have a cookie that can go in the freezer and come out when company is coming! Cookies were good, nice blend of flavors … but too cakey for my taste. I did double the recipe including the eggs, but just one egg might have been better. I baked the first batch at 375 for about 10 minutes but cookies were too dark & too baked so I turned down to 350 & baked for about 11 minutes, not over-baked & not as cakey either. Will definitely try again! Thanks for the helpful tips!! I love having a stash of these in the freezer. I’m the only coconut lover in the house so I like pulling just one or two out for me after dinner! Fabulous! My kids enjoyed these!! They asked for another batch! This is perfect because I always end up eating way too many cookies! Love that this is a small batch recipe! My favorite candy bar in cookie form! I love cookies! These look yummilicious! 😍 Will follow your intructions in making them. Thanks so much! I hope you enjoy them as much as we do!! I like everything almonds and the almond joy cookies is a perfect snack for me. I would make a batch of them and just save it for the week like you. Thanks for sharing your recipe! I love a small batch cookie! I am not a fan of coconut but my family loves it. Might be a good way for me to make a snack i WON’T eat! I am going to try this recipe for my boyfriend (he looooves cookies) this weekend when he comes over! May practice fest but it looks pretty simple! Look delish! Cheat day is Saturday…… I can’t wait to make these. These sound so delicious! That’s one of my favorite candy bars. Cookies and almonds = my two favorite things to munch on! So glad I found this recipe; will definitely try this out! Thank you! The ingredients are all my favorites & this cookie would surely be a delight. 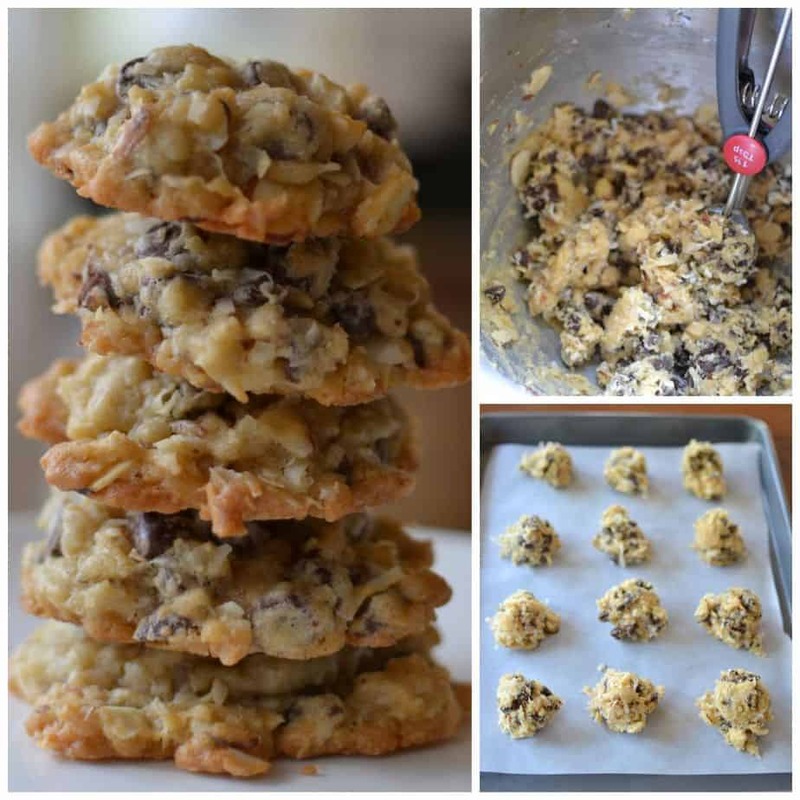 Okay, I totally have a soft spot for cookies and this recipe is making me so hungry now! I’ll have to try these out next week. I am so glad you have instructions for freezing and thawing these delicious cookies! Great info; can’t wait to try these for myself! these cookies look so good! will definitely share with my bf as he loves cookies, and almonds. hahaha perf treat for him! I LOVE cookies and this one seems really yummy. Will surely try out your recipe.